Nicaragua's President Withdraws Social Security Reforms That Sparked Violent Unrest : The Two-Way A local human rights group says at least 25 people have been killed, and that the government is to blame. Now, President Daniel Ortega has called off the planned changes to the welfare program. Students clash with riot police agents close to Nicaragua's Technical College during a protest against government's reforms in the Institute of Social Security (INSS) in Managua on Saturday. The changes sparked demonstrations Wednesday that escalated into several days of violent anti-government demonstrations. "The protests have killed at least seven people and injured hundreds more," Ortega said in his message to the country, according to Reuters. But a local human rights group, the Nicaraguan Human Rights Office (Cenidh), says at least 25 people have been killed in the clashes. 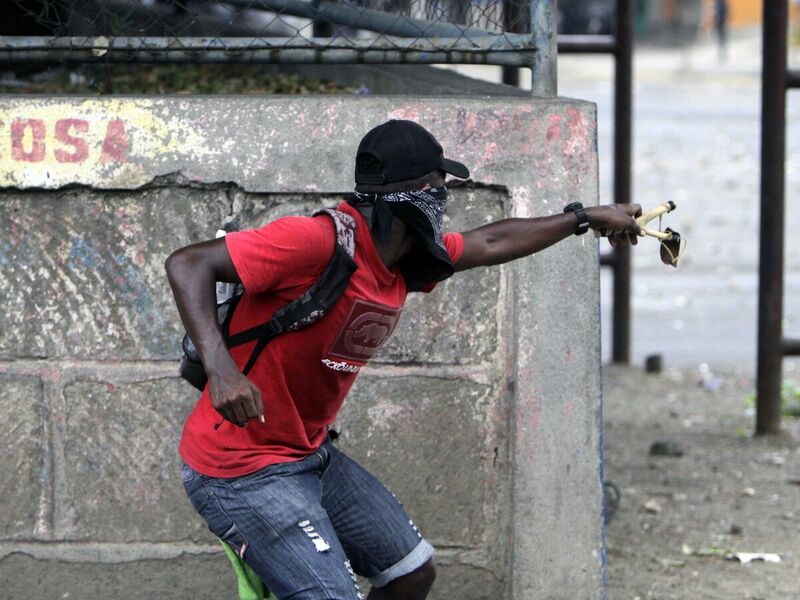 President Ortega's forces are accused of using live rounds to quell the demonstrations. The protests have been partly driven by students in the capital of Managua, but have rippled to at least 10 cities across the country. In the coastal city of Bluefield, a journalist broadcasting on Facebook Live was reportedly shot in the head and killed. Angel Gahona was talking about a broken ATM machine when a gunshot is heard and his body slumps to the ground. The video, which has been widely circulated on social media seems to have poured fuel on the protests. Ortega has been in office since 2007. This is his fourth term as president, and the protests are widely seen as his biggest challenge yet. Men cut cables and metal parts to sell on the market from the Nicaraguan Government steel tree (Life Trees) burnt down during a protest against the government's reforms in the Institute of Social Security (INSS), in Managua on Sunday. 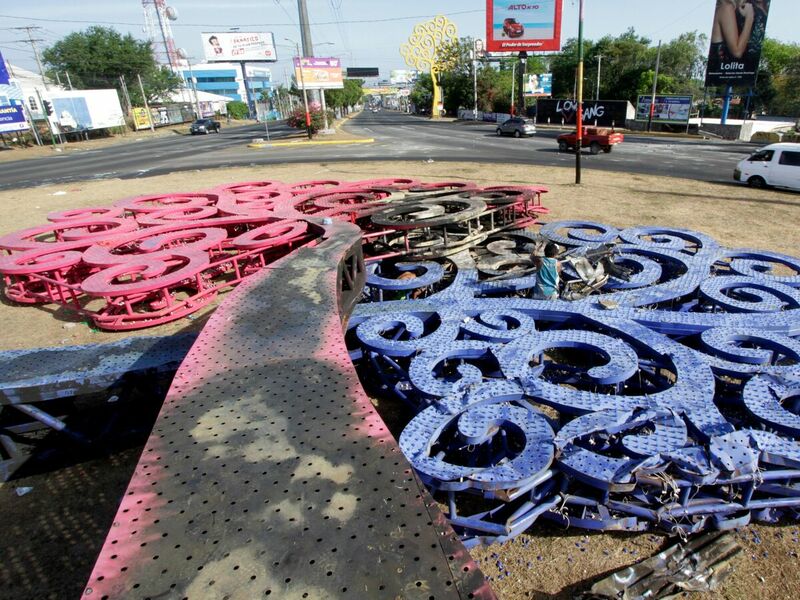 In Managua, protesters are reportedly looting dozens of businesses and have also toppled a tree of life sculpture that was erected as part of the First Lady and Vice President Rosario Murillo's beautification initiative. The toppling of the sculpture seen as a purposeful reprimand of Murillo. On Sunday, Pope Francis called the bloodshed in Nicaragua "useless" and called for a peaceful resolution "with a sense of responsibility." The U.S. State Department is calling for calm in the country, saying in a statement, "We condemn the violence and the excessive force used by police and others against civilians."